It’s hard to believe I was only seven when I first saw the golden-hued bat-symbol shining from the movie poster for Batman, but as a super hero fan since birth, that movie was far from my first introduction to the Caped Crusader. Strange as it may sound, my first glimpse of the Bruce Wayne in his alter-ego was courtesy of the animated adventure, Scooby-Doo meets Batman. There I was watching the Mystery Machine roll across the screen, when suddenly these guys in capes are battling an evil clown and his tuxedo wearing buddy in a haunted fun house. Not only was there a guy with pointy ears attached to his mask, but a shorter hero in green shorts was along for the ride. I was confused at first by all this colorful action, but I quickly realized it was way more exciting than the time Sandy Duncan was the guest star on The New Scooby-Doo Movies. Don’t remember Sandy Duncan? Yeah, me neither. It wasn’t long before I started catching the Dynamic Duo in live action on Saturday afternoon re-runs. Adam West and Burt Ward really made those characters come alive in an entertaining way and the BIFF! BAM! POW! brought me back for more when some of the high-level jokes went over my head. For some reason I thought Victor Buono as King Tut was the ultimate bad guy and the one time John Astin (Gomez from The Addams Family TV show) played The Riddler instead of Frank Gorshin, really threw me. I also remember the Batgirl episodes always being a special treat. It was so cool to see her kick a bad guy and ride by on her Bat-Cycle in the alternate opening credits scene. Meanwhile on Saturday mornings, Batman and Robin were back in animated mode playing hero on The Super Powers Team: Galactic Guardians. I remember really enjoying the action on this show and it led me to seek out the toys from Kenner’s awesome line of Super Powers action figures, for which it was basically 22-minute commercial. Batman and Robin were first on my list during the next trip to the toy store, but my favorite tie-in was the Burger King “action” figure cup. The idea of having a removable figure as the handle for a kid’s cup was genius and I don’t know why Burger King didn’t produce more of these. Honestly, who wouldn’t want Batman playing dark protector to their Nestle Quik? TV, Cartoons and Toys were my window to the world of Batman during those formative years, but then in the Spring of 1989, I got my first glimpse of The Dark Knight. While over at my friend David’s house one afternoon, he started telling me all about a Batman movie that was coming out that summer. He was going on about how Batman’s costume was black and he shot machine guns. I called shennanigan’s on him. After all, everyone knew Batman wore blue and grey while throwing Batarangs or fists, never guns. So he marched me into his teenage brother’s room and pulled out a comic book called The Dark Knight Returns by Frank Miller. I only briefly thumbed through it, but sure enough, there was a mean looking Batman firing a machine gun, at police no less! Then I turned the page to something that really blew my mind…Robin was a girl! I could understand maybe Batman being pushed too far and needing to even the odds with a firearm, but Robin becoming a redheaded teeny-bopper with green sunglasses? Ridiculous. But I still wasn’t seeing this black costume he was so sure about, then he showed me the toys. We carefully crept into David’s teenage brother’s room and there on the shelf were action figures of The Riddler, The Penguin, Two-Face and boy, did they look mean. Two-Face was the one that stood out to me the most, with his scarred face and giant coin that rotated when wound up. But above them all stood the man, the Bat-Man, dressed in black, just like David said! I couldn’t believe my eyes, it didn’t register to me that it could be the same character, but the truth told by the pointy ears and a utility belt was undeniable. All at once the Batman movie became a dangerous mystery to me, one I was sure to get to the bottom of. Luckily I didn’t have to work too hard at that, Bat-merchandise was everywhere! I honestly don’t know how I had missed it all before, because as soon as I saw action figure evidence it seemed like I couldn’t get away from the gold and black Bat-Symbol. It was on T-Shirts, candy dispensers, and even cereal! It was as if every store owner in the USA saw the trailer for Batman and said, “I want in on some of that action”. Which is odd because this was not the traditional colorful, comic-booky Batman that would seemingly appeal to kids, it was a leather clad tough guy who looked ready to kill. But to kids raised in an era of Robocop and Rambo that was what we were expecting. It was like kids of the world said, “Go ahead and put this tough guy on our shorts and we’ll buy ‘em!“ If the models above are any indicator, there was absolutely no shame in wearing a Bat-Symbol on every inch of your body in 1989. I’ll never forget the day my Mom took me to JC Penney’s and while walking through their shoe department I beheld the most amazing footwear ever designed. I had zero interest in buying clothes that afternoon, but then I looked up to see display tower in the aisle and realized that that Converse had put Bat-Logos on their hi-tops. My jaw dropped, “Super heroes on your shoes? Whoa!” Even more amazing was the fact that The Joker got his own branded kicks too, complete with his signature cackle. They were really something to behold. I didn’t dream of asking for them, but now I knew that no stone would go unturned in this marketing bonanza. The NES was still the biggest thing in town at this point, so you better believe they put a video game together. Mostly I remember how dark the game was, it just seemed so grimey compared to colorful world of Super Mario Bros. It was like Metroid meets Castlevania, except that Dracula killed Simon Belmont’s parents…wait, did he? If you didn’t yet have a Game Boy (it had just come out after all), you could make due with the Tiger Electronics handheld game while waiting in line to see the movie for the 20th time. Oh yeah, the movie! I knew I forgot something. My most vivid memory of experiencing the film at the movie theater is during the final moments as Danny Elfman’s iconic score hits a crescendo and we glide up to see Batman posing on a rooftop next to the Bat-Signal. I had been so thoroughly entertained, it was the perfect musical expression of my youthful exuberance. One character who left a major impression on me for some reason was the crooked detective, Eckhardt. I just loved the disgust in his delivery of the line, “You ‘aint got no future, JACK” and the fact that Nicholson’s “A-1 Nut Boy” gets his revenge by poignantly declaring, “Hey Eckhardt, think about the future” BAM! You might also recognize the actor playing Eckhardt as rotund rebel pilot, Porkins from Star Wars, who is blown to kingdom come at the movie’s climax. Man, that guy can’t catch a break! The advertising campaign didn’t just add money to Warner Bros. box office figures either. As we walked out of the theater I immediately asked my Mom to drive me to the nearest Toys R Us, where I purchased a Batmobile by ERTL and a black-suited Batman to call my very own. I’m pretty sure I talked her into buying a pack of the trading cards as well, so I could re-live the excitement of what I had just seen in picture form. In fact, I picked up a few packs from the Retro-Daze points store myself recently. If you’re in the mood to re-live the feeling of opening a wax package concealing photo-filled cardboard rectangles, I recommend submitting an article to earn some retro-currency stat. OK, shameless plug for the site over. I think the greatest testament to the notoriety of the film is that when the VHS tape came out, they didn’t have to put the title of the film on the magazine ads or even the box! That symbol instantly told be people all they needed to know. It’s no wonder Prince (who contributed quite a bit to the soundtrack and the film’s popularity) tried this himself a few years later by becoming a symbol. Unfortunately, he became a punchline while Batman and The Joker laughed all the way to the Gotham City bank. And the merchandising didn’t stop after the film hit theaters. At the beginning of the VHS, they actually had Bugs Bunny and Daffy Duck shilling for Batman merchandise in the Warner Bros. catalog, you can watch it for yourself along with the classic Coca-Cola commercial by clicking here. All these years later, Batman is still one of the most entertaining movies ever made. So many quotable lines and I appreciate the fact that Burton managed to keep some humor in there without making fun of the character. As good as the Nolan films have been, they never managed to create a cultural event the way this film did in 1989. Sure they got our money, but they gave us some memories to hold on to in return. For that reason I’ll always be a Bat-Fan at heart. So what about you? What were your experiences with the film? Did you get a Bat-Symbol shaved in the side of your head? Did you dress as Bob the Goon for Halloween? Batman was one of my favorite movies I saw as a kid. I think we watched it a couple of times at the drive-in that summer. I remember hearing in the months leading up to it people would actually go to theaters and buy tickets just to watch the previews for the Batman movie then walk out when the preview was over. I still have the VHS copy although my VCR kinda died a few years ago so I bought the four pack of Batman movie DVDs from Wal-mart a year ago. I remember this well. I was 10 that summer. Everyone was so excited for this movie. It was everywhere. I even remember the local news having stories about the movie coming out and the local excitement. I was already a huge fan of the Adam West show and had action figures and such. It was a good time. @Hoju my gym bag has a velcro square on it for "morale" patches. I got a glow in the dark one off eBay that looks pretty sweet. I'd post a pic but not sure how to in the comments. We will be getting Avengers 2 and Star Wars... so it is bound to be a pretty decent year for sure. My brother and I walked four miles to a Shopko to see the new Batman figures and Batcave. To me as a 12 year old kid it seemed like an epic journey. Not sure why we didn't ride our bikes. @NLogan Yeah, those variations in the Batman and Joker head sculpts are so interesting: square jaw, round jaw, Joker with double hair curl. Glad you got to enjoy so many parts of this moment in time. Jack Nicholson was the stand out performance of the movie for me. I had the Super Powers blue Batman, the Penguin, and the Joker (I still have the Joker). I had the Ertl Batmobile and the micro versions of the Batmobile, Batwing, and Joker Van. I had the movie version black suit Batman and the Joker with his different head sculpt and paint job. I ate the Batman cereal with bank, had the cards, spent hours beating the NES game. Hoju, we haven't had too many movie years like 1989 in the 21st century, have we? I remember the handheld game, btw. @vkimo I never knew you were such a Batman devotee. Did you attach this velcro bat-symbol or did you buy it that way? I am intrigued. @Vaporman87 glad you can back me up on this. Speaking of Batmania, there was a VHS that came out around this time called "Holy Batmania!" covering the phenomenon. My copy no longer plays, but I remember this segment of Adam West as Batman at some rinky-dink fan event giving it his all to entertain. It was sad and inspiring at the same time. Interesting that you had Mantis, he came at the end of the line when Kenner started throwing in lesser known characters, just because they had cool designs or making up new ones altogether. @thecrow174 Yeah, the return of Indiana Jones and Ghostbusters in '89 were just some the highlights, I wonder if we will get a year like that in the 21st century. 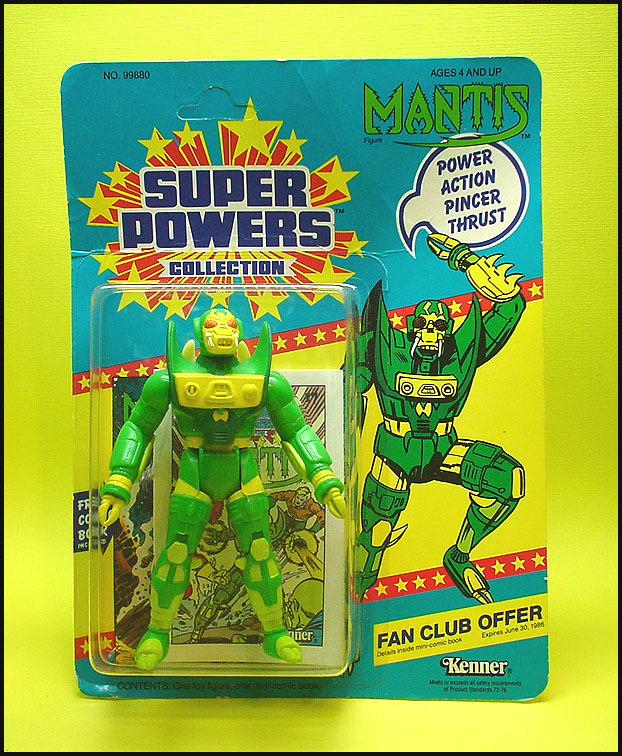 One other memory that this article popped into my head, although a bit off topic, was that the first toy my dad purchased for me in the aftermath of my parents divorce, was a Super Powers Mantis figure. I don't know why, but that has stuck with me for my whole life. 89 had a ton of memorable movies. This was one of the most memorable. If it could fit the Bat symbol, then it was fair game. I was at a flea market awhile back and this guy had dozens of the Batman coin bank cereals for sale. I regularly wear a Batman print shirt to the gym and have a velcro bat sign on my duffel bag. My main memory of this movie is that, the months leading up to (and after) it's release were what I'd call "Batmania". NEVER before in my youth had I witnessed a marketing push like that which this movie enjoyed. As you said, you could not escape it... no matter where you were. I had seen products emblazoned with the bat symbol that would never had occurred to me to be something you'd market a film on. It was just insane. And the thing was, I fully recognized it. Even then, at the tender age of 16, only just becoming allowed to drive by myself, I would often think, "Man, this is just crazy." And it worked. That movie was all you read about, heard about, or talked about when it came to films that year. And that's saying a lot, because '89 is arguably one of the best years ever for movies (from a fan perspective anyways). I had that magazine you pictured (might even still have it somewhere). And I know I still have the semi-hardback comic based on the film. I think I may even still have a very threadbare black t-shirt with the '89 bat symbol on it. No doubt about it... 1989 was the year of "The Bat".